In 2017, the Bill & Melinda Gates Foundation funded Cultivate Learning to be a partner in pre-k quality improvement, adding us to their national early learning strategy, which invests in publicly funded preschool programs in Washington, Oregon, and Tennessee. 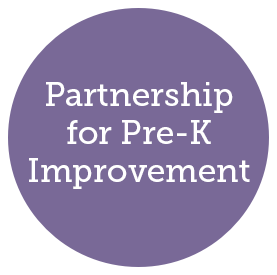 The Partnership for Pre-K Improvement (PPI) is a multi-year, cross-sectoral study focusing on improving the quality of state-funded pre-k programs in partnership with our anchor partners—Ounce of Prevention and Alliance for Early Success. Utilizing knowledge gained from these improvement processes, our goal is to inform statewide improvement of early learning systems in other parts of the nation. The central aims of the project are: first, to facilitate research practice with state partners; second, to strengthen the state partners’ role in continuous quality improvement of these programs; and third, to conduct a process evaluation of the statewide quality-improvement efforts through case studies and development of new tools. By the end of the study in 2021, our goal is to have an interactive and evaluative tool that is useful for other states as they work to implement or improve pre-k. The Implementation Development Map (IDM) is a quantitative tool designed to capture multiple aspects of statewide improvement. The IDM, combined with the case studies, would allow those in the field of early learning to understand the intricate connections and unique conditions of programs in any state. Statewide successes have the potential to generate sustained improvement across the country, setting the national standard for pre-k.
Soojin Oh Park, Co-PI and Case Study Lead, Assistant Professor in Early Childhood and Family Studies, UW College of Education.